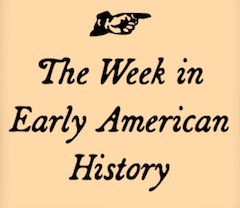 Welcome to the Week in Early American history. On to the links! We start off TWEAH with one of my favorite topics: food. This season the Art Institute of Chicago hosts Art? and Appetite: American Painting, Culture, and Cuisine. This piece considers the history of slaves who sued for freedom–sometimes surprisingly successfully. Over at Historians Against Slavery, John Donoghue examine’s slavery’s connections to persisting human trafficking issues today. We’ve also go a new biography of Jonathan Swift up for review. And then you can go read about Mark Twain’s autobiography, which offers some reflections on the process of censorship and editing, too. This Wired article looks at how newspaper stories went viral in the nineteenth century. Someone’s written another lovely ode to Twitter. And finally, this post proposes that eleven separate nations make up the not-so-united United States. « Whither Early American Intellectual History?